Maithiri or Ranil rules Sri Lanka? Tamil political prisoners Called off Hunger Strike Following President Sirisena Pledge of Resolving Issue by November 7th but now PM says NO WAY! The hunger strike by suspected Tamil political prisoners was called off on the 16th October on an assurance given by the President Maithiri to establish a mechanism to look into their grievances and finish the process between October 31 and November 7. In retaliation to the announcement of President Maithiri PM Ranil Wickremasinge who wants to show his power announced today that the ‘Sri Lankan Government’ Refused To Grant Amnesty To Tamil Political Prisoners as promised by President Maithiri before 7th of November. The government today ruled out the granting of a general amnesty to nearly 300 Tamil political prisoners (some held for over 15 years without trial) who engaged in a hunger strike recently, demanding their immediate release or take them to court. The decision on refusing an amnesty to prisoners had been arrived at a meeting chaired by the Prime Minister. However, the Prime Minister during the meeting had advised officials of the Attorney General’s Department to consider granting temporary release under bail conditions for those prisoners who can be granted such a facility until their cases are taken up in courts. Officials of the Attorney General’s department during the meeting insisted that granting a general amnesty for the prisoners was impossible as they had been arrested under Prevention of Terrorism Act (PTA). AG’s department officials said that they will soon file legal action against a number of prisoners who have been in prison without any charges for more than 15 years have now found credible charges against them. They pointed out that legal action on a number of others were currently proceeding in courts. Tamil prisoners, including former LTTE cadres at the main high security prison in Colombo started a hunger strike last month demanding the immediate release of Tamil political prisoners or take legal action against them as some of them have been in prison without charges for more than 15 years. The prisoners last month called for a pardon and refused to suspend the fast until they got an acceptable solution. After five days the prisoners ended their fast after assurances made by the President ASSURED THEM that by the 7th of November they will be released, and several Tamil political leaders including the opposition TNA assured that their issues will be looked into within a short period of time. Tamil National Alliance MP and spokesperson M.A. Sumanthiran called on the Sri Lankan government to release all political prisoners, as he visited hunger striking inmates at Anuradhapura Prison. Mr Sumanithran, accompanied by Provincial Council members Asmin Yakoob and Sanankiyan Sayandan, demanded the government release the prisoners as agreed and stated if there was no response in the coming days, he too would join the prisoners in their hunger strike, according to a party press release. When questioned TNA Parliamentarian M. A. Sumanthiran said the that party was currently studying the outcome of the meeting chaired by the Premier and will make its stance known shortly. 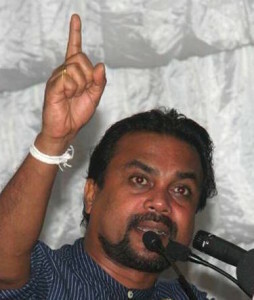 UPFA MP Wimal Weerawansa a well-known racist and a close associate of former President Mahinda severely criticized a government decision to release the Tamil political prisoners, who recently engaged in a five day fast. Weerawansa fears that the release of some ex-LTTE cadres may become witnesses for the state in trials which will be carried out against Rajapaksha brothers and the military officers at the proposed Hybrid Court for War Crimes committed by them. The Boossa detention centre along with other main prisons in Welikada and Kalutara became well known in the North and the East following the arrests of scores of Tamil men and women by the Sri Lankan Security Forces in the North and the East with the beginning of the Tamil militancy in the early eighties. When the 47th session of Eastern Province Council was proceeding on 20.10.2015, there was a proposal and speech by Eastern province member and Lawyer Allah J. M. Lahir to release the Tamil political prisoners detained in prisons to enable them leading their normal life and to support ethnic unity in the Eastern Province Council which consists of members talking all three languages. In a statement coinciding with the anniversary of the Bindunuwewa massacre of 27 Tamil political detainees, People for Equality and Relief in Lanka (PEARL) called for the release of Tamil political detainees in Sri Lanka. Former Minister and the Eelam People’s Democratic Party (EPDP) Leader Douglas Devananda was one of the hundreds of Tamil political prisoners who were put behind bars following the emergence of Tamil militancy. However, Devananda managed to escape from the Welikada Prison riot which was aimed at the Tamil detainees when the Black July riots broke out against Tamils in 1983. Meanwhile Prison sources said that prisoners were contemplating re-launching their hunger strike as their demands had not been met. Will the TNA join them as promised by pro government TNA spoksperson MP Smithiran is to be seen.